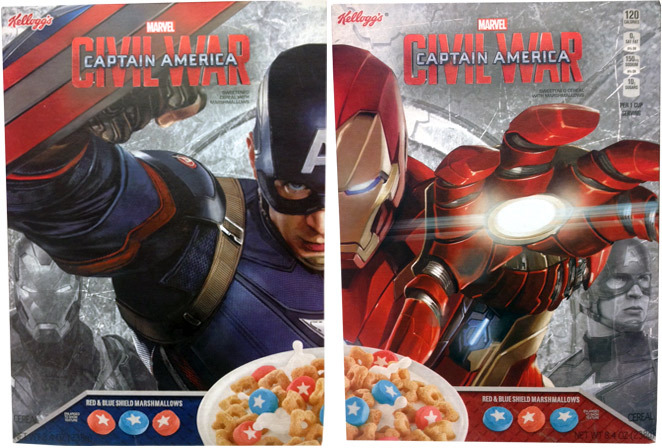 packaged FINDINGS: Kellogg’s® Marvel Captain America cereal has super stand out packaging – but what about the brand? This week’s packaged FINDINGS: Kellogg’s® Marvel Captain America cereal has super stand out packaging – but what about the brand? Holy Super Hero! I walked into the grocery store, and before I even got to the carts, I was stopped in my tracks by the display of boxed super heroes staring me down. OK, I am a great fan of the Marvel super heroes – there is something epic and wonderful about these larger than life characters. So I reached for a box – and kept flipping it over and over – Captain America on one side, Iron Man on the other, both of them on the side panel. It wasn’t until I looked more closely at the package that I saw this was a Kellogg’s breakfast cereal. How could I not immediately deduce that? I think I got hung up on the phenomenal heroic illustrations on the primary panels of package, which completely overtook the cereal brand. It took some looking to find the very small Kellogg’s logo in the upper left corner of the package, only marginally larger than the Marvel logo over the new “brand” Civil War Captain America. The descriptive copy, sweetened cereal with marshmallows, is set up in a very fine, small font, on top of an active mottled grey background and nestled just below Civil War – probably unnecessary due to the cut away of a bowl of cereal with red and blue “shield” marshmallows in the lower corner of the package. From a packaging standpoint, this is nothing but pure fun. The reproduction quality of the super hero images is incredible. However from a branding standpoint, I think the Kellogg’s message is a bit lost. Yes, it is the iconic cereal size box, and of course the product image says cereal, but there is nothing about the cereal except the nutrition facts on the side panel. This is all about the Marvel brand. Is this package effective? I am sure it will sell, however, I assume this is a limited edition product, designed to tie into the release of the new Marvel Civil War movie, so I don’t think it will be on shelf for long. Nevertheless, children and families everywhere will want their own super hero box. For Kellogg’s – I’m unsure if this will advance their brand – people will probably see this as the “Iron Man/Captain America” box – and Kellogg’s is going along for the ride. To me there is a missed opportunity. If this is more about movie merchandising, I think in addition to my grocery store vestibule, the POP could just as easily be positioned in the lobby of every theater showing the movie. Breakfast cereal, movie snack and memento all in one – MARVELous!